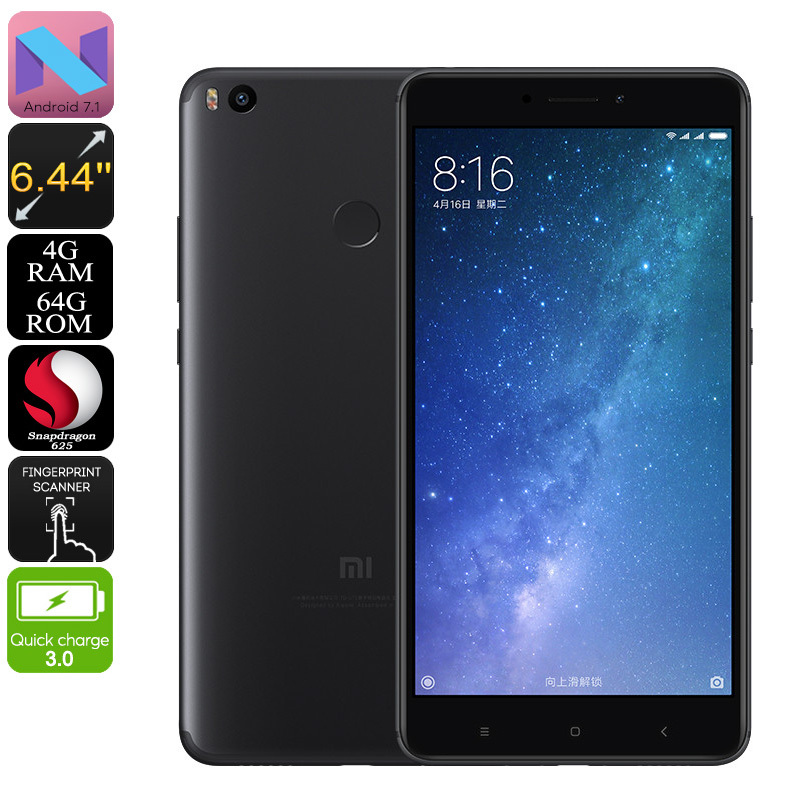 Successfully Added Xiaomi Max 2 Android Phone - Snapdragon CPU, 4GB RAM, Dual-IMEI, 4G, Android 7.1, 6.44-Inch, 1080p, Quick-Charge 3.0 (Black) to your Shopping Cart. Undergo a stunningly smooth smartphone experience with the Xiaomi Max 2 Android phone. This beautiful smartphone features a sleek design and comes with a crisp 6.44-Inch display. On this screen, you’ll be able to enjoy all your favorite media in1080p Full-HD resolutions. With a Snapdragon 625 Octa-Core processor and a whopping 4GB of RAM in place, this Android phone is sure to meet your toughest demands. If you’re into mobile gaming and entertainment, the Xiaomi Max 2 won’t let you down. The phone packs plenty of storage with its 64GB of ROM. It furthermore supports a 128GB SD card so you won’t have to worry about running out of memory any time soon. The Xiaomi Max 2 Android Phone packs a powerful 5300mAh battery. With this cell at your side, you’ll get through an unbelievable 20 hours of continuous usage time and 18 days standby time. With this Android phone, you’ll be able to head out with confidence without ever needing to worry about battery life again. Whenever you’ve run low on juice, your cell phone can be recharged in the blink of an eye thanks to Quick-Charge 3.0. With Dual-IMEI numbers, this smartphone treats you to great connectivity. The Android phone furthermore supports 4G for the fastest mobile network experience. Thanks to its Android 7.1 operating system, this cell phone is guaranteed to treat you to a smooth user experience. Whether you use it for browsing the web, playing games, or watching movies – nothing is too much for the Xiaomi Max 2. The phone even comes with a professional-grade 12MP rear camera that lets you shoot 4K video and breathtaking images.